Journalist and publisher Brandt Ayers's journey takes him from the segregated Old South to covering the central scenes of the civil rights struggle, and finally to editorship of his family’s hometown newspaper, The Anniston Star. The journey was one of controversy, danger, a racist nightrider murder, taut moments when the community teetered on the edge of mob violence that ended well because of courageous civic leadership and wise hearts of black and white leaders. The narrative has outsized figures from U.S. Attorney General Robert Kennedy to George Wallace and includes probing insights into the Alabama governor as he evolved over time. 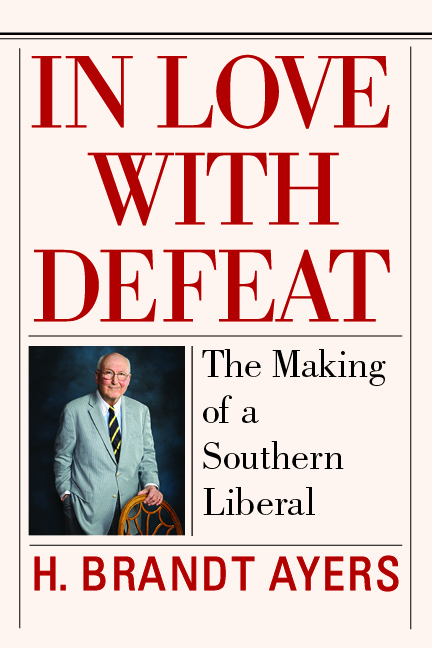 High points of the story involve the birth of a New South movement, the election of a Southern President, and the strange undoing of his presidency. An Afterword, made imperative by the cultural and political exclamation point of a black President, bridges the years from the disappearance of the New South in the 1980s to Barack Obama’s first term.